Have you ever driven by a truck weigh station on the interstate highway? Or perhaps you’ve driven by a feed processing plant and noticed a truck scale out front? The odds are that most of us have done one or the other of the scenarios above. So, how does a truck scale work? A truck scale is a large set of scales, typically installed permanently on a concrete foundation, either above ground or in a pit that is used to weigh trucks and their cargo. By weighing the vehicle both empty and when loaded, the load carried by the vehicle can be calculated. Typically the truck scale will have several load cells underneath the platform. Truck scales can be installed above ground with a ramp leading up a short distance and the weighing equipment underneath or they can be pit mounted with the weighing equipment and platform in a pit so that the weighing surface is level with the road. They are typically built from steel or concrete and by nature are extremely robust. In earlier versions the bridge is installed over a rectangular pit that contains levers that ultimately connect to a balance mechanism. The most complex portion of this type is the arrangement of levers underneath the weighbridge since the response of the scale must be independent of the distribution of the load. Modern devices use multiple load cells that connect to an electronic equipment to totalize the sensor inputs. In either type of semi-permanent scale the weight readings are typically recorded in a nearby scale house or office. Truck scales are usually utilized to either sell or charge by weight (Trade Approved) or by check weighing both axle weights and gross vehicle weights. This helps to stop axle overloading and possible heavy fines. Truck Scales are used in industries that manufacture or move bulk items, such as in mines or quarries, garbage dumps / recycling centers, bulk liquid and powder movement, household goods, and electrical equipment. Since the weight of the vehicle carrying the goods is known (and can be ascertained quickly if it is not known by the simple expedient of weighing the empty vehicle) they are a quick and easy way to measure the flow of bulk goods in and out of different locations. A single axle truck scale or axle weighing system can be used to check individual axle weights and gross vehicle weights to determine whether the vehicle is safe to travel on the public highway without being stopped and fined by the authorities for being overloaded. Similar to the full size truck scale these systems can be pit mounted with the weighing surface flush to the level of the roadway or surface mounted. What are Truck Scales For? Have you ever wondered why do we even need to weigh trucks? Or why do we even need weigh stations on the interstate highway? Weigh stations were created to enforce safety regulations for big trucks that you see on the highway. These truck scales allow each state to check the freight carrier’s compliance with fuel tax laws; to check weight restrictions; to check equipment safety and to check compliance with Hours of Service Regulations. A Truck scale is a large set of scales, usually mounted permanently on a concrete foundation, that is used to weigh entire vehicles and their contents. By weighing the vehicle both empty and when loaded, the load carried by the vehicle can be calculated. Weigh stations are regulated by individual state governments and therefore have vastly different requirements from state to state. They are typically operated by the state’s Department of Transportation (DOT) or Department of Motor Vehicles (DMV) in conjunction with the state highway patrol or state police, thus enabling enforcement of applicable laws. The federal maximum weight is set at 80,000 pounds. Trucks exceeding the federal weight limit can still operate on the country’s highways with an overweight permit, but such permits are only issued before the scheduled trip and expire at the end of the trip. Overweight permits are only issued for loads that cannot be broken down to smaller shipments that fall below the federal weight limit, and if there is no other alternative to moving the cargo by truck. Permitted oversize trucks are often required to coordinate with the Departments of Transportation and law enforcement agencies of the transited states before the trip begins, as most states require oversize trucks to be escorted. 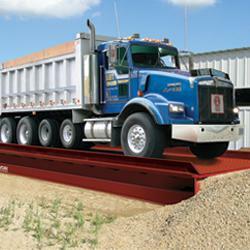 Many states have weigh in motion technology that allow a continuous flow of truck weighing. When we read about this case study below, we felt that we just had to share it with our readers. A scale company in Iowa installed a very unique scale system which utilizes three LPRA railroad track scales. The system also utilizes Cardinal load cells, 825 digital weight indicator, SB500 Remote Display and Remote Weigh Mobile App for iPad. The grain facility typically weighs 25 car sets of corn for ethanol or corn sweetener and 18 car sets of beans. The Cardinal railroad scale was purchased instead of an overhead load-out weighing system and offered significant savings for the customer. The way the system works is an eastbound train pulls railcars onto the scale to get the Tare weight on scale platforms #3 and #2 and then Gross and Net are determined when the train pulls forward onto scales #2 and #1 with a special tare. Custom software developed by Cardinal Scale and installed in the 825 Spectrum weight indicator allows the operator to turn scales on and off as railcars come across them to prevent weighing railcars when unnecessary. The 825 indicator’s special software also incorporates a temporary Tare weight for the operator to get a target fill weight using a fill program to fill up or top off the last part of a railroad car. Then, cars are pulled forward by a trackmobile into final weighment position to receive their Gross, Tare, and Net weights. Even though we mainly focus on truck scales, we thought many of our readers would appreciate the new Cardinal LPRA railroad track scale which is now available. Cardinal Scale Manufacturing low-profile LPRA railroad track scales come with either electronic or hydraulic USA-made stainless steel load cells, up to 270-ton capacity, rugged steel weighbridges, Wi-Fi and mobile app options, NTEP and Measurement Canada legal-for-trade certification, and E-80 Cooper AREMA rating. Twenty different standard models are available from Cardinal Scale in different lengths and capacities to accommodate any combination of car length, and custom applications and configurations are also readily available. Mounted above ground in a shallow, concrete foundation, Cardinal’s LPRA rail scale is engineered to stabilize shifting ballast resulting in weight errors. Installation is rapid, simple, and can be handled locally requiring usually only about two days. Weighbridge sections arrived assembled, ready to set in, and load cell assemblies are easy to install. Grain dump grating is also available to expedite the unloading process. Accuracy is in accordance with NIST, AAR, and AREMA requirements (railcars uncoupled at both ends). We mention it all the time on this website but a truck scale is a major investment and anytime you invest in something like that you want to make certain that you protect your investment. One key area of importance is where you locate the scale on your property and the scale foundation. Producing over one million tons of product per year is an impressive feat for any industry. At Giant Cement in Harleyville, S.C., this annual quantity reflects the effective strategies implemented throughout their lean manufacturing process. Producing and transporting this amount of cement requires a devoted workforce and equipment that never stops. The 24/7 demands can take its toll on equipment and installing durable scales is integral to keep product moving. Giant Cement requires the most durable truck and rail scales to handle its high volume of trucks per day and constant stream of rail cars. They turned to Rice Lake’s SR truck scale and a custom-designed railroad scale to meet their needs. Just about every business is looking for ways to make their business more efficient and to save money. One easy way to do that is to research and plan ahead when it comes to things like locating a truck scale on your property. By putting a scale in a certain location it can increase uptime and profitability as opposed to leading to more service calls, increased cleaning times and increased down time. Why is My Scale Printer Not Working With My Weight Indicator? Often end users will ask about adding a printer to their existing scale or perhaps to a new system they are requesting. And quite often the end user is under the impression that adding a printer to a scale is as simple as going to the electronics store and buying a computer printer and plugging it into the scale via USB. Unfortunately, adding a printer to a scale system is not usually a plug and play application. So to answer the question, why is my label or ticket printer not working with my indicator? Let’s take a look at the answer provided by Cardinal Scale. Label printers come from the factory set in a graphics mode (called page mode) while Cardinal indicators send data in a line mode from the print tab setup. It is often possible to set the label printers to line mode, but this can be difficult and is ultimately the less effective option. We recommend creating a graphic-type ticket using Cardinal’s nControl software that can be used to create custom headers and set font sizes. This has been proven to work well with the label printers that Cardinal sells. Works great when designing print outs for indicators such as the 190, 205, 210, or 225. What Should A Metal Recycling Company Ask When Purchasing a Truck Scale? For the next few entries we are going to answer some frequently asked questions about buying a truck scale. In the first entry we answer the question below. What exactly is the difference amongst a full-length truck scale and an axle scale? Which variety do you notice recyclers employing most frequently? An axle scale is designed to weigh only a single individual axle of a large vehicle at one time and may possibly give an overall total gross weight at the conclusion of weighing the truck. Axle scales are frequently portable, but could also be permanent installations as well. For example, check out the video below. On the other hand, full-length truck scales, usually 70 feet long can weigh the entire truck (all axles included) in a single weighment, so axle scales need more time to weigh up a truck than full-length weighing machines. Recyclers will normally use full-length 18 wheeler scales due to the fact axle scales will not be NTEP legal for trade, which is needed in the recycling industry. Recycling businesses are having to pay men and women depending on the load of the timber in their particular vehicle load, so consequently it’s important for the scale to be NTEP listed for correct weighments. In brief, the process involves individuals bringing in their recycled copper, the metal recycling company compensates these individuals for it depending on the weight displayed on their truck scale, and so the recycler then usually utilizes a railcar to deliver the material to steel mills. 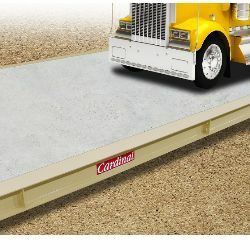 For more information on Cardinal Truck Scales, contact authorized distributor Central Carolina Scale, located in Sanford NC. How Do I Install a Weight Alarm Buzzer into My Indicator so I Know A Truck is on the Scale? One of the questions that quite a few folks ask about from time to time is How do I install a weight alarm buzzer into my Cardinal Scale weight indicator to let me know when a truck is on my scale? Of course the driver could just call the scale operator using a cell phone. Or, the truck driver could lay on his horn until somebody noticed. Well, those are probably not the best choices. This installation is most commonly requested for the Cardinal 225 indicator, although a similar setup can be done on the advanced 825 from Cardinal. For the 225, you will need to purchase Cardinal part number 6620-0016 which should mount in place of the larger gland connector in the back of the 225. The red wire for the buzzer will plug into pin 2 of the P15 connector. The black wire will plug into pin 10 of P15. Once this is connected, enable the weight alarm within the ID Storage mode of operation settings. Cardinal Scale’s EPR-LF series portable vehicle scales are the ideal answer when a scale is needed that can be moved from site to site. Industries such as rock quarries, sand and gravel pits, and logging companies must relocate equipment from time to time to maintain efficient product flow. The complete scale is contained in modules which are furnished with lifting eyes for easy moving. Simply lift, move, and lower the scale to its new location for weighing with minimal time and effort necessary. Optional steel ramps, guide rails, weight indicators, remote displays, and lifting kits are also available for the EPR-LF truck scale. Standard features of the scale include Checkered Steel Deck, Durable Anti-Corrosion Powder Paint, Heavy-Duty Structural Steel Tubing, Low-Profile 16-inch Overall Height, Made in USA Quality Measurement Canada Certified, NTEP Legal for Trade, Self-Contained and Portable, and SnapStream Wireless Connection Between Scale Decks and Indicator. Best of all, SnapStream wireless connectivity comes standard with the EPR-LF. This allows wireless communication between scale deck modules and the Cardinal Scale weight indicator for seamless integration between all scale components and alleviates the need for rewiring every time the truck scale is moved. SnapStream is a digitally controlled weighing and diagnostic system that is NTEP legal for trade and designed utilizing the Zigbee protocol for reliable and accurate weight and data transmission for truck scales. One of the more popular digital weight indicators currently available is the Rice Lake 720i Programmable Indicator/Controller. While not as robust as the legendary 920i this indicator is a great choice for many truck scale operators who are looking for easy to use simplicity. The 720i from Rice Lake is an economical choice for those looking to increase functionality and simplicity. Make no mistake, this is an advanced intelligent indicators but it’s not quite the same level as the 920i so most users develop a level of comfort using it fairly quickly. From basic weighing and data collection to recipe formulation, inventory management and traceability, customers have grown to love the Rice Lake’s 720i. Advanced programmability is available using ProAction (PCEE) and enhanced data base storage make the 720i ideal for a wide variety of weighing applications. The indicator is available in both universal and panel-mount configurations. In the entry today we wanted to share a video with you. In this video you will see an actual demonstration of a truck scale in/out using a ticket printer. Over the years we have had quite a few folks ask us for this basic overview of a typical truck transaction using a ticket printer. In this example we are using a Rice Lake 720i weight indicator and the process can be slightly different, depending on which indicator you’re using and how it has been set up. As you can see in the example, we have a blank ticket in the printer and a truck drives on the scale empty. His weight is 20,000 pounds. We press the Weigh In key, assign him an ID number and press print. The truck then pulls off the scale. Now when the truck returns, loaded this time he drives back onto the scale and his weight is displayed as 50,000 pounds. We press the Weigh Out button and enter our same ID number that we used earlier and press the print key. Now you can take a look at the print out and see everything that was printed. The time and date are there along with the ID number. You also see the original empty weight of the truck listed as the tare weight which is 20,000 lbs. You see the net weight of product that was added to the truck which is 30,000 lbs. Finally you see the gross weight which is the total weight of the truck and the product which is 50,000 lbs. As you can see, the truck in / truck out process for vehicle scales is pretty straightforward. Scale operators will need some training and it’s always a good idea to have a laminated quick start instruction guide handy as well.